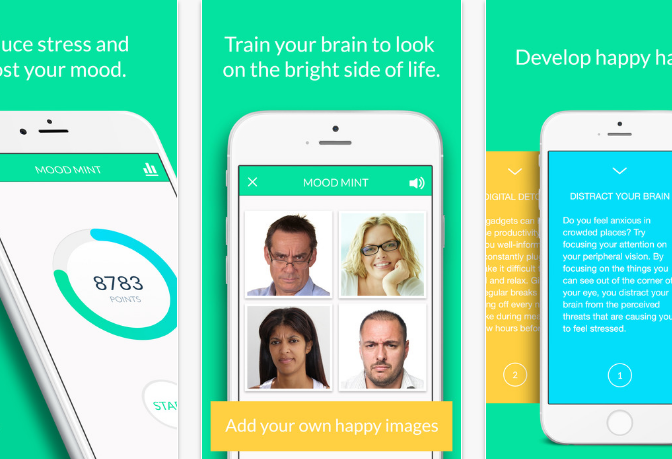 Mood Mint is an app aimed at reducing stress and anxiety, and improving users’ overall mood through the incorporation of brief exercises that increase the salience of positive thinking. It combines Cognitive Bias Modification (CBM) – where people are trained to focus on positive information (e.g., a picture of a happy face) over negative information (e.g., a picture of a sad face) – with the priming of positive thinking and a breathing exercise. In each session, users are tunneled through four exercises: a CBM-based game in which the user must tap on the positive image as quickly as possible; happy notes, which include various tips and exercises; a positive word search game; and a short breathing break accompanied by animation. Users can modify some of the features to suit their preferences (e.g., add pictures, remove notes, etc.). The developers recommend 5–10 minutes of daily use. Summary is not provided for programs with an evaluation score below 3.